It is a joint venture between LSBU's School of Applied Sciences and Academy of Sports. The Sport and Exercise Science Research Centre (SESRC) has access to sophisticated equipment which enhances research activities. You can take a virtual tour below. The detailed knowledge of its academics is applied to assess, advise and monitor not just athletes but also people of all ages and abilities who are seeking to maintain and improve their health and quality of life. Read more about a recent research partnership with Actegy, a leading name in the design, development and marketing of innovative healthcare technologies. Working with LSBU experts, they developed and commercialised a range of medical devices to stimulate improved blood circulation and improve general health. 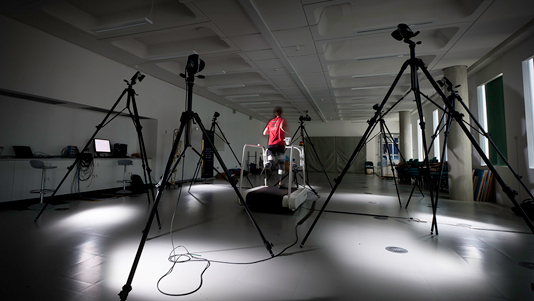 73% of our research into Sport and Exercise Sciences was awarded the two highest ratings: 4* world-leading or 3* internationally excellent, for overall quality by the Research Excellence Framework (REF) 2014. 90% received 4* or 3* for 'impact' (reach and significance) and 75% a 3* for 'environment' - "conducive to producing research of internationally excellent quality, in terms of its vitality and sustainability". The centre has achieved some notable successes, not least a significant increase in income generation through highly-competitive enterprise funding from the health industry, as well as through national and international research grants and collaborations. Research activities make full use of the School's Sports Laboratory for recording and analysing data. The centre offers, on a competitive basis, MPhil/PhD programmes to highly qualified individuals with a keen interest in the research topics above, which can be self-funded or supported via fully and match-funded scholarships. Students are able to study part-time or full-time in a range of areas and are taught by expert academic staff. The wide range of research activities, and the excellent facilities in the centre, together with the mix of academic staff, post-doctoral research fellows and visiting professors with internationally recognised expertise, allows us to offer a stimulating and diverse postgraduate environment. Read more about Research Degrees at LSBU. In 2008, the centre established the Human Performance Centre (HPC) as the vehicle that identifies research ideas with potential impact and provides an effective route for the commercialisation of its research. The centre also works closely with the University's Academy of Sport as a conduit to professional bodies within National Sport and community organisations. The centre's vision is underpinned by its scientific strengths that promote and enhance the impact research activities achieve by offering market leading innovative and technology-driven solutions to improve human health, wellbeing and physical performance. These benefits also generate success for the centre's industrial partners. The centre is well-respected for its expertise. It has a firmly established track record in generating and supporting scientific, evidence-based marketing claims and developing and commercialising intellectual property through research and working on development grants (e.g. Knowledge Transfer Partnerships and Knowledge Connect) that allow commercial partners to stay ahead of their competitors. Read more about Knowledge Transfer at LSBU. Find out more about Research for business. The applied nature of the centre's research and enterprise activities capture the interest of our students. They are given the opportunity to assist with existing projects and athlete testing which allow them to acquire vocational skills desired by employers in the sector. The SESRC has extensive experience of seeking out financial support via external and internal studentship grants to carry out their work. Traditionally, our academic team accommodates exchange students from other UK and European Universities on academic internship and work placements schemes, or as part of their degree project work.